VLT Road Contact - Suspension / Roller Brake Testers as Stand-alone version. The most advanced solution to offer your Vehicle owners the service they expect from you as service - maintenance organization. This equipment is made for heavy use! Same as you find in the better equipped Vehicle Stations. Standard available with nice and clear 22"TFT Monitor in Console on Pedestal and wand console for Controller and motor relays. Or as top model with stylish Console with printer compartment and keyboard shelf. Really an eye catcher in you workshop. With the purchase of this combination you get the best equipment available in the market. 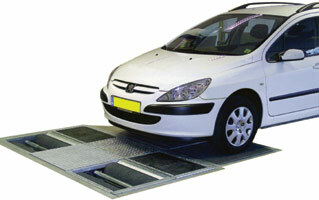 The Road contact Tester operate according the well-known EUSAMA principe. No reference value needed, just give you the correct Safe / Unsafe conditions of the Vehicle. In addition to the usual road contact values, the following values are also measured and displayed: the contact value difference, resonance frequency and wheel weight at minimum contact value, tyre pressure value, wheel weight and axle weight. There is a general final evaluation so that all these values do not have to be interpreted after every test. This is indicated by means of green, orange and red icons. The Suspension Tester is used in combination with the Brake Tester. The two pieces of equipment are fitted in one single frame, monitored by the same computer. In our standard configuration we make use of a 22"TFT Monitor. The axle weight measured by the Suspension Tester is also used for the calculation of the brake efficiencies. The VLT 3673/MK2 is a more advanced development of the VLT 3673/M, still fully based on the EUSAMA principle. The VLT 3673/MK2 has the newly developed phase shift measurement, making the EUSAMA measurement somewhat more flexible for the lower wheel weights of small vehicles. The frequency of the VLT 3673/MK2 is controlled by a frequency inverter.